A preformed device within a denture which connects to a precision or magnetic component on a tooth or implant. For the tooth component add item 645 – Precision or magnetic attachment that is included as part of a restoration, a magnetic or precision retention device matched by an opposing attachment on a bridge or denture. The other components of the bridge or denture should also be itemised. For the implant component add item 661 – Fitting of implant abutment – per abutment. This is the fitting of the foundation (abutment) for a future crown or denture into the implant (also known as a fixture) that is within the bone. Allowance within a denture, to add a denture tooth, that immediately replaces an extracted tooth. This is usually done by taking a model of the denture in the mouth that records the tooth to be extracted and then on the model removing the natural tooth. The new denture tooth is made and when the actual tooth is removed the denture with its added tooth is placed over the extraction site. This allows controlled healing around the denture. Used with item 768. (A future blog). Provision of a special lining to be used for the tissue bearing areas of the denture. This lining creates a firm cushion against the gums. This is added to new denture item numbers. The procedure can also be done on existing dentures. This can be helpful for people who get frequent ulcers under dentures or who gums are very thin over the bone. 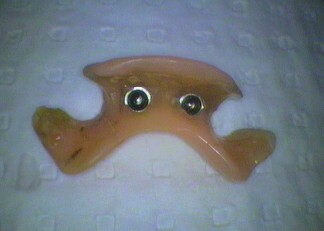 This is a metal bar that joins parts of an acrylic denture. It is not casted framework like those in items 727, 728. Extension of metal from a casted framework (items 727, 728) to provide a backing to the denture tooth. This is done in heavy biting situations where the bite is on the metal rather than the denture tooth. The metal backing is hidden and prevents the denture tooth from breaking away from the denture. Once a denture is made it’s not the end of the story. The mouth and body are always on the move!